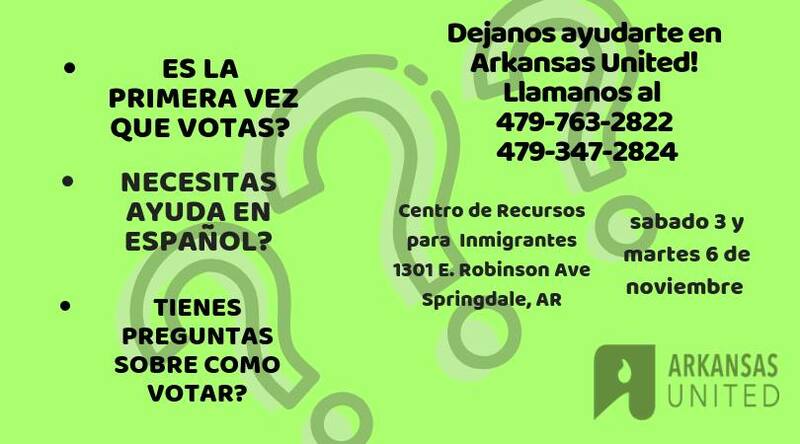 The midterms elections next Tuesday are some of the most important for our Arkansas immigrants. We must all participate in this civic exercise as if our families depend on it, because for many, they do. #UniteTheVote for ALL of our communities. We at AU have been proud to register 500 new voters this election cycle, and are currently staffing phone banks, knocking doors, engaging in social media and offering translations of voting materials, to arm Latinx and Asian Americans and Pacific Islander voters. Our AU Get Out The Vote (GOTV) captains have already made 60,000 attempts to reach our Arkansas voters by phone and door, with 30,000 more to be made between now and Election Day. Count on us to continue to make daily posts on Facebook throughout these final GOTV days, including with reminders on early voting locations and times. For any questions, support or to report any voting problems, call our AU State Hotline at 479-763-2822. Arkansas, the rest is up to you: get educated and vote! Remember: AR vote, is AR voice and AR power!